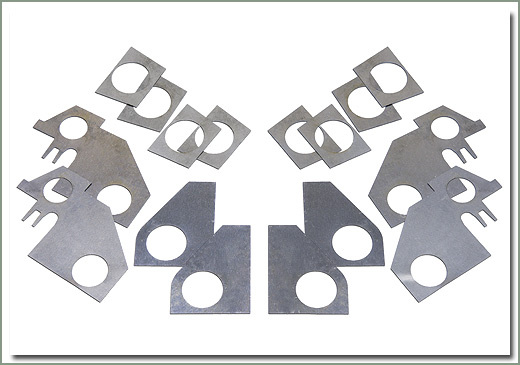 Fits 58-9/73 F gas engine - Kit includes a complete set of both .004 inch (.1mm) and .007 inch (.18mm) shim thicknesses. Ordering our Piston and Gasket Kit saves you the time of looking up all the individual parts and saves money compared to buying individual parts. 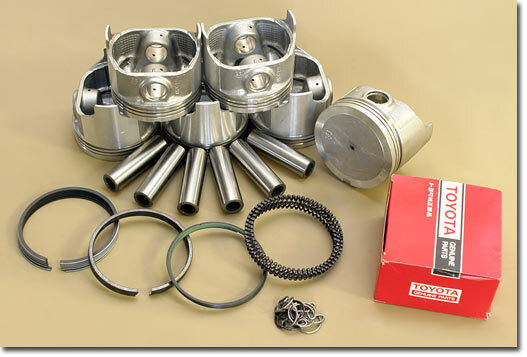 Kit includes overhaul gasket set (see page 032 for contents), 20 over pistons & rings, oil pump, freeze plugs. If needed order separately #034-12-U-KIT Crankshaft Kit, and #050-16A-R-KIT Camshaft Kit, you'll have the parts you need to rebuild your engine. Fits 1958-1967 F gas engine - Comes with overhaul gasket set, pistons (size: .020 over) & rings, rebuilt oil pump (oil pump has a refundable core deposit), and freeze plugs. Fits 1968-9/69 F gas engine - Comes with overhaul gasket set, pistons (size: .020 over) & rings, rebuilt oil pump (oil pump has a refundable core deposit), and freeze plugs. Fits 9/69-9/72 F gas engine - Comes with overhaul gasket set, pistons (size: .020 over) & rings, rebuilt oil pump (oil pump has a refundable core deposit), and freeze plugs. Fits 9/72-9/73 F gas engine - Comes with overhaul gasket set, pistons (size: .020 over) & rings, rebuilt oil pump (oil pump has a refundable core deposit), and freeze plugs. Fits 9/73-12/74 F gas engine - Comes with overhaul gasket set, pistons (size: .020 over) & rings, rebuilt oil pump (oil pump has a refundable core deposit), and freeze plugs. Fits 1/75-6/76 2F gas engine - Comes with overhaul gasket set, pistons (size: .020 over) & rings, oil pump (oil pump has a refundable core deposit), and freeze plugs. Fits 6/76-8/80 2F gas engine - Comes with overhaul gasket set, pistons (size: .020 over) & rings, oil pump, and freeze plugs. Fits 8/80-8/87 2F gas engine - Comes with overhaul gasket set, pistons (size: .020 over) & rings, oil pump, and freeze plugs. 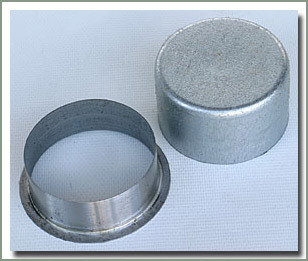 Specter Off Road offers a SpeedySleeve to repair a crank pulley with a grooved seal surface. If you can catch your fingernail on the groove where the seal rides, then you need a SpeedySleeve. Comes with installation tool and instructions. 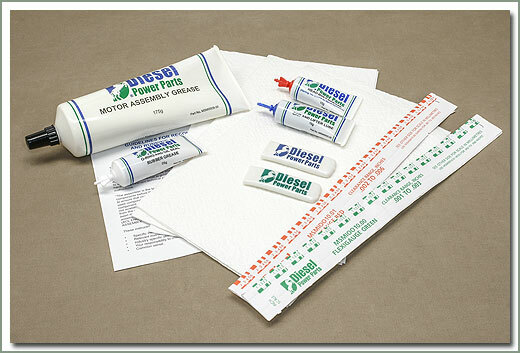 Are you planning on rebuilding your engine? If so, Specter has made ordering all those parts easier. 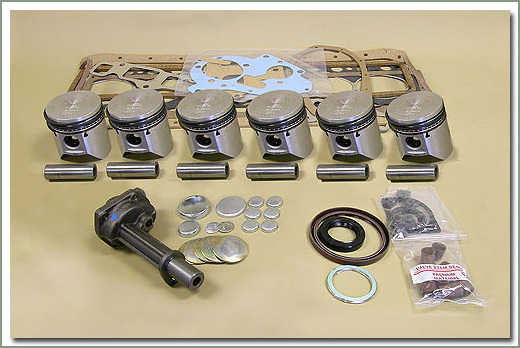 By ordering Piston & Gasket Set, #034-12-U-KIT Crankshaft Kit, and #050-16A-R-KIT Camshaft Kit, you'll have the parts you need to rebuild your engine. Always refer to your factory engine manual for factory specifications for repair of your Land Cruiser engine. See page 221 for a complete listing of all the engine manuals available.